Shame that Ingram and Hart got hurt...having those 2 for Portland and Denver, the results are probably different. Thanks Emplay for an interesting read on this. Interesting that, when our starting lineup is intact, we're about a +5 average scoring margin team, which is much more like a deep playoff contender than a bottom dweller. Too bad that intact lineup spans so few games. If we took this exact same roster, played next season and managed to stay healthy, I don't think it's unreasonable to say we'd be competing for about the #3 through 6 seed spots in the playoffs next year. I think the last month of this season does matter for the Lakers, and I'm really hoping both Brandon Ingram and Josh Hart can make it back on the roster. I think we could win a lot of our remaining games if BI comes back soon and Josh can rejoin the team around the start of April. Closing out the season losing more games than we win and finishing around 34 wins will not convince many free agents that the Lakers have turned the corner. To me 39 wins, a 12 game improvement, and closing the season continuing to play .600 ball is a much stronger statement. Thanks Emplay, next year is gonna be a great season, I’m already excited to see what we do this summer with FA and trades. Yes, the hardest part of making the playoffs from where we are is having to climb over so many teams. We don't really control our destiny. Sorry but you dont forget playoffs you never give up or quit. Look Clips have a tough schedule. I think we will catch them we beat denver tuesday and we are 5 6 games back of them? We just have to dominate rest of way and hope for denver and utah collapse. The 1990-91 Lakers won 16 in a row. How about Zubac and Thomas Bryant? Hoopshype says team option, so a decision has to be made before free agency. Would you let they walk to maximize space? I think the team should pick up their option. Other than Ingram/Ball/Hart/Kuzma, they have many roster spots to fill. Zu and Bryant are cheap known bigs. Agree we need to know what we have in Zubac ad Bryant. Can they hold down the center position with JR next year? I’m done with Zu, he’s probably gotten his shots blocked like 8-9 times in these past 2-3 games, he is to slow to keep up with mobile bigs, Bryant is gonna take 3-4 years until he’s ready to contribute to a winning team. We need to collect guys who can help us win now, we can’t keep relying on projects and young players. He's not implying that the team is going to quit at all. With Ingram, Hart and now Kuzma unable to play, we have too much stacked against us to come back to the 7th or 8th spot. Yes, it's mathematically possible. But, several other teams would have to thoroughly implode. It's simply not realistic. When I see Wear, Caruso and Zubac on the floor at the same time.. I know we are gonna lose! 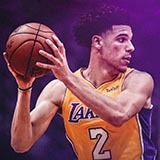 We need our guys back (BI, Hart & Kuz) and we need to trim the bench and get more minutes out of the guys that ARE producing NOT the guys we HOPE can produce.. If those three were playing in Cleveland, the media would be raving about them. Being 5-6 games back doesn’t mean we are 5-6 games back. It’s 5-6 net wins back.